Installation of the Synfire Pro 1.9b54 version on Windows 8.1 fails for me, doesn't install at all. I've downloaded the latest beta. However, now when I simply load the NI Maschine plugin and hit the spacebar, Mashine starts but immediately stops. It will not play through. However, if I load BMP from MOTU it plays straight through. Please help. What about a feature "create new containers" by double clicking or dragging the mouse in the top area? (should be like creating new midi regions in a daw). That's merely immediately after switching colors. Next window you open it's ok again. New container with keyboard is really fast. Just select a span on the ruler and Command Shift N.
As for the other bugs and quirks: A new build is online now. Let us know if there are still issues. NI Maschine still not working correctly with the new update. Please help. First of all thanks for great support . I think that mostly problem solved for mac. But It's small problem for palette. Chord progression is larger than one octave. For example Cm ; (Not always sometimes missing) C2 G2 Eb3 was chosen automatically. Can you solved this small problem? Chord notes are true. But Not near each of them. One octav far away. Much Obliged Andre. Re NI Maschine: Yes, there's a bug with the Engine not providing correct position information to hosted plug-ins. This has been fixed already (along with new support for time signature changes), but we still need to test a bit before publishing. I only hope my body will fend off the flu that's currently around me all day. Can't wait to get 1.9 finished. Re Palette chords: Sometimes voice leading for live chords messes up. If you change the playing range of the instrument, it will likely go away. I'm running MacOS 10.14.2. Two problems I have with 1.9 is that trying to use the scaleboard very often locks up the program, and I have to force it to quit. The other problem I run into is that when recording notes from my midi keyboard, I can't hear what I'm playing unless I first select a section in the figure's staff. New builds #63 are online now. Let us know if NI Maschine works again. Recording, sync and playback should be better now. Lots of other stuff has been fixed. Negative time is now disabled by default. If you know your plugins and DAW can deal with it, you can enable pre-roll before song start per arrangement (Sync prefs in Arrange window). Synfire build #63 requires Engine 3.1.4, so please update that even if it is not enforced by the installer. Earlier version don't work anymore. Re last post: MIDI Through requires you to select a target instrument first. Recording does not automatically do that (maybe it should). The notes go into the correct figure, so I for sure have a target instrument selected, and I can hear the notes I'm playing on the midi keyboard before clicking record and after clicking stop. Like I said, I can see the notes when I'm done, just not while I'm recording. If I use the span tool to select a portion of the staff, the behavior is like it was in 1.8.5. Scaleboard is even wonkier. It either works or it freezes the program and requires a force-quit. Hi Andre, As my friend said that there is a silent record problem. When I recording any figures I didn't hear anything. Thanks for great support. Have a nice holiday. Pre-roll left of the start of the arrangement has always been an issue, at least when a DAW is synched. It is undefined whether negative transport positions are supported. Synfire standalone should support this, though. Will have to look into it. Oh, and new builds just came online with bug fixes and performance improvements. I would delete the item "Phrase" from menu File > New and I would just keep File > New > Library. Agree. Standalone Phrase files don't make sense. They are a remainder of the early days of Synfire. There are more features we would like to assess and weed out in order to simplify the user interface and code. Some initially nice ideas turned out to be used rarely. I wonder if we should start collecting a use counter per feature and ask users to eventually email us the text file. Use the Left Arrow key ;-) Possibly it's not labeled correctly, though. New builds #69 are online now. We're nearing the official 1.9 release soon. thank you but please fix the count-in missing clicks! Thanks Andre. Also please check the articulation part. If we have chosen a segment as an articulation It has played wrong note. For example Ample Guitar. Please enable negative time in the arrangement's external sync options (the clock tab). This will temporarily fix it. Admittedly, user intervention should not be necessary here. Will look into it. Yay, Synfire Pro 1.9b69 finally runs for me. The installation needs some compatibility mode trickery for Windows 8. Many thanks to André for giving me great support in this case, certainly spending a lot of time. New build #70 is online now. Fixes the metronome issues and more. Thanks Andre for great supports. But Unfortunetly I still couldn't achieve to make articulation . Maybe I did something wrong. Can you try to add articulation any plugin. Maybe Problem is used to one more articulation at the same time. For example Ample Guitar. We have to use pattern strumming and chord articulations at the same time. Much obliged! scaleboard still locks up synfire and makes me force quit on MacOS Mojave. For me Synfire 1.9b70 runs quite stable so far, although it still requires compatibility mode trickery on Windows 8.1, at least on my system. Without the compatibility flag the installer as well as the installed product hangs after invocation. I've done a video that shows it runs pretty stable for me. There's just one graphical glitch when zooming, it starts to show at around 09:20 in the video. Apart from that it works great despite me trying to provoke crashes by invalid inputs and opening several windows at once. In the Library window, I'd reduce the left column to two windows only: folders and pool parameters. Folders containing pools that contain phrases should be opened hierarchically in a single window, as is the case in Studio One pool view (figure below). 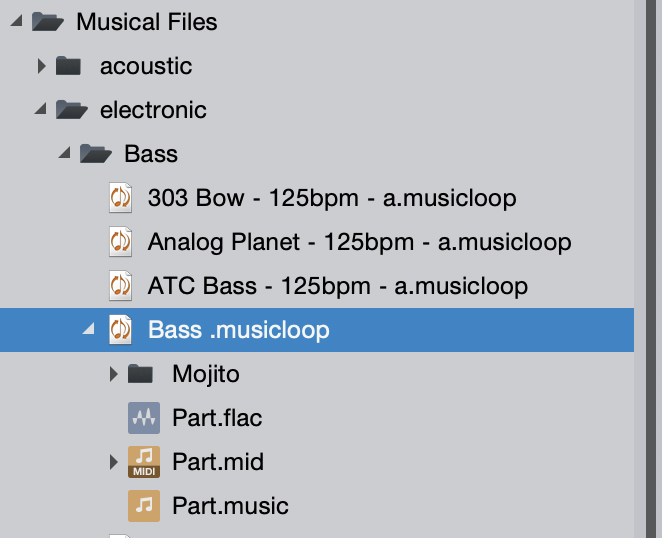 In addition, when you create a new empty pool inside a folder you should automatically create a new empty music phrase to record. Alternatively you could delete the menu item "Pool-> New " Leaving the user the choice or not to group the musical phrases in pools at a later time. To be honest I would eliminate the external Libraries (New > Library) and would adopt the principle "one project, one library", with the ability of swapping elements from one library to another between different projects.